Tickets are $79.00, $59.00 and $39.00 and go on sale Friday, April 12th at 10:00am through Ticketmaster. Ticketmaster customers may log on to Ticketmaster.com. Tickets will also be available at the Mohegan Sun Box Office beginning on Saturday, April 13th at 10:00am, subject to availability. 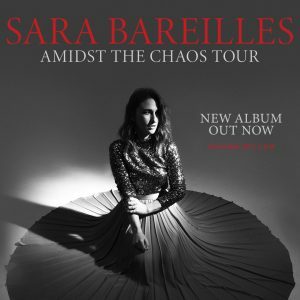 Sara Bareilles first achieved mainstream critical praise in 2007 with her widely successful hit “Love Song,” which reached #1 in 22 countries around the world from her debut album Little Voice. Since then, Sara has gone on to receive seven Grammy nominations throughout her career, which include “Song of the Year” and “Best Female Pop Vocal Performance” for “Love Song” and one “Album of the Year” for her highly acclaimed third studio album, The Blessed Unrest. Her book, Sounds Like Me: My Life (So Far) in Song, was released in the fall of 2015 by Simon & Schuster and is a New York Times best seller. Making her Broadway debut, Sara composed the music and lyrics for Waitress, for which she received her first Tony Award nomination for “Best Score” and a 2017 Grammy Award nomination for “Best Musical Theater Album.” She also made her Broadway acting debut in 2017 by stepping into the lead role in Waitress. 2018 was a big year for Sara, she co-hosted the Tony Awards, was nominated for an Emmy and Grammy for her role in Jesus Christ Superstar Live in Concert, and was awarded with the Songwriters Hall of Fame’s “Hal David Starlight Award.” Sara also teamed up with Apple as an executive producer for Little Voice a 10 episode series, which she will create the original music for.